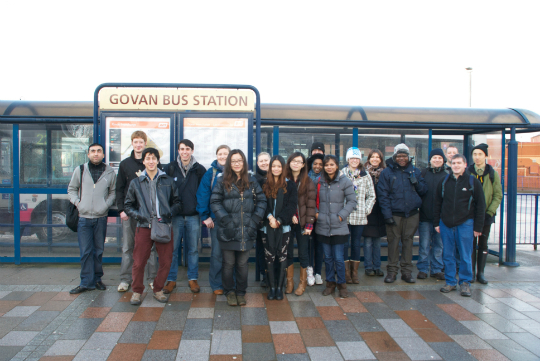 This year’s Spatial Planning Strategy project, which Kevin led with Amine Kamete, involved devising a strategy for the historic Govan neighbourhood of Glasgow. With ancient roots dating from before Viking times, Govan underwent rapid growth in the 19th century, but equally rapid decline with the collapse of shipbuilding and other industry in the later 20th century. With a much reduced population the place has many contemporary challenges including connectivity, housing, but particularly employment and health, as student research showed from the many datasets. Eamon Campbell of Glasgow City Council provided much needed baseline background and insight, as the student groups sought to devise their own particular strategies for renewing prosperity to the area. Some concentrated on the historic identity and distinctive separateness from the city centre identity, while others sought to integrate with new bridges. Several sought to provide new reasons to visit for leisure and tourism activity, while new modes of employment from engineering to culture, to health sector R&D were advocated. Nearly all sought to add a measure of new housing, particularly close to the river, where they also proposed that a stronger interface with the Clyde was necessary. Coming from such a diverse nature of backgrounds, both internationally and Scottish, these group strategies showed a growing maturity in analysis and thought, while their increased capability and confidence with digital graphics meant that their presentations were cogent, overtly spatial and often colourful too.